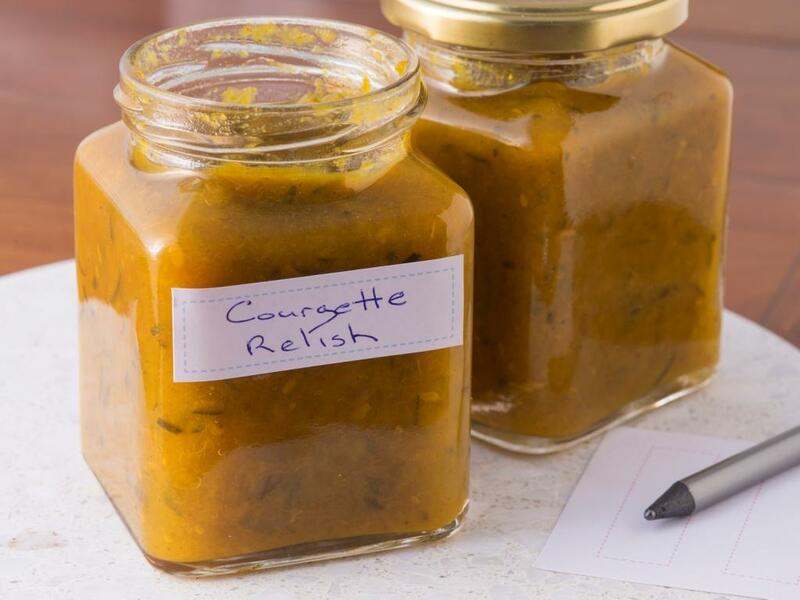 Make the most of your courgette harvest with this relish recipe. When stirring relish to prevent sticking, make sure your spoons scrapes the bottom of the saucepan, especially towards the end of cooking time. Trim courgettes and cut into thin slices. Peel onions and chop finely. Layer courgettes and onions in a bowl, sprinkling salt between the layers. Leave to stand for 8 – 12 hours or overnight. Drain the liquid from the courgette mixture. Do not wash.
Place drained courgettes in a large saucepan. Peel core and cut apples into 1 centimetre cubes. Add to courgettes with sugar, vinegar, mustard, turmeric, cloves and curry powder. Reduce heat and cook uncovered until the mixture is thick and no free liquid sits on top of the mixture. Stir the mixture regularly to prevent sticking. Spoon into hot, clean dry jars and seal.